Call owner William at 631-903-0769. 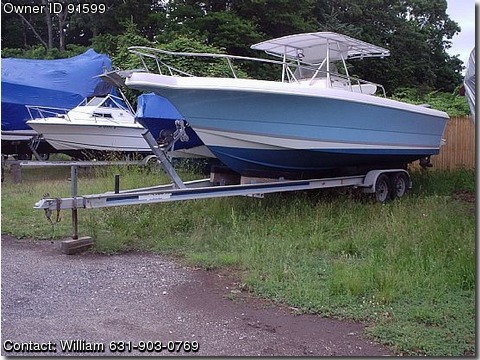 27 CENTER CONSOLE W/TWIN 250HP YAMAHA OUTBOARDS. HULL RECONDITIONED IN AND OUT . T TOP, LEANING POST, TRANSOM DOOR, SALTWATER WASHDOWN, FREASH WATER TRANSOM SHOWER, DUAL BATTERIES W/SWITCHES,NEW CUSHIONS AND T TOP COVER. HYDRAULIC STEERING, FFURUNO FISHFINDER, VHF ,GARMIN GPS/MAP. HAS A DUAL AXLE ALUMINUM TRAILER INCLUDED.